Since the air is thinner at higher altitudes, it filters less ultraviolet rays. Also, the sun reflects more on the snow, making it more intense and bright. High-speed wind can blur your vision and make your eyes tear as well. 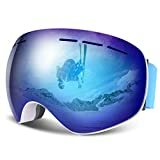 Having a pair of ski goggles is crucial, as these can protect your eyes from any such hazards. But can you reliably pick ski goggles randomly without doing some research first? 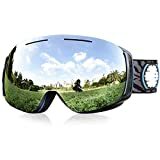 To enjoy skiing and other winter sports to the fullest, eye gear is important. This guide will include all the information you need for buying the best ski goggles. 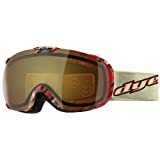 There are two types of ski goggles available in the market, based on the type of lens used: spherical lenses and the cylindrical or flat ones. Spherical lenses curve both vertically and horizontally, which lends a bubbled look to the goggles. Spherical lenses give greater peripheral vision, which means you have a wide field of view (a good view of above and to the sides). Because of the strategically-designed curves, the spherical lens can avoid glare and distortion. 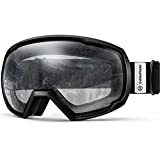 The space between your face and the cold is greater when wearing these goggles—that means better air flow and insulation, which reduces fogging within the ski goggles. Cylindrical or “flat” lenses are less expensive compared to spherical lenses. They have a horizontal curve to them while having a flat design in the front. 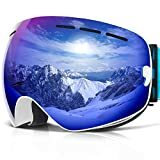 Warranty and return policy: Before you buy ski goggles, you should take some time to read and understand the return policy and warranty features. Most of the stores accept returns of undamaged goods, provided there are no scratches on the lens. Desirable features: Apart from the design and type of lens, you should also take a look at other features, such as the face foam, which creates a layer between the user and various implants. Multi-density foams are much better than single density foams because multi-density foam makes the goggles more comfortable. Nowadays hypoallergenic foams are also used in ski goggles. 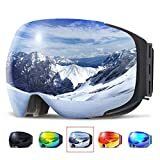 Use reputable brands: Research well before you select your pair of ski goggles. The market is full of inexpensive counterfeits. Even when you have to pay a little extra, it is good to go for the well-renowned brands, because they probably last longer. 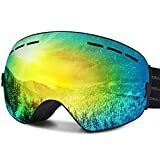 Try multiple pairs of goggles before choosing one: Check out the specialty optical stores, or well-stocked sports goods shops to find the best goggles. Try as many as you can, and, if possible, check how lenses work in natural light. Those who want clear lenses for night riding or skiing should test them in a dark room so that you can note any distortion or glare. Select the perfect lens tint: You need to think about the terrain, the sport, and the weather conditions when choosing the right tint for your lenses. The tint in the lens should have the perfect balance between depth perception, contrast, eye protection and color definition. All these factors should be combined with visible light transmission to get the perfect lens tint. Get a good fit: All the technical specifications will be wasted if the ski goggles do not fit well. Take your time to adjust the strap and buckle—if you feel any pain, search for a different model. Also, the goggles should fit well with or without the helmet, because you may not be using a helmet all the time. 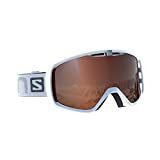 Oakley: The Shaun White Signature Series from the house of Oakley is known for its fascinating Switchlock technology, where the lenses change color according to the ambient light. This brand is known for its superb technology and unmatched optically correct vision, and it has been catering to winter sports enthusiasts for years. 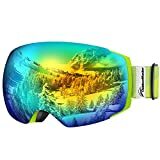 Smith: The brand is probably the undisputed leader for snow goggles. 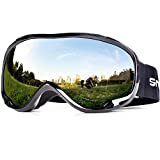 Those looking for the best all-around snow goggles will find Smith’s models particularly useful. Although the brand’s interchange lens system has been now surpassed by Oakley, users still prefer Smith, because they provide different models in a wide range of prices. Look for the ChromaPop lenses, which offer a color quality similar to HD images.